I rather like this panel. Reed rarely gets down and dirty with a villain, and his combat with Namor has lasted for the majority of this issue. There are times when it's been like proper wrestling (with a few extra-length limbs thrown into the mix). Here, though, Reed seems to be channelling a little bit of The Absorbing Man (and, co-incidentally, I'm watching the first episode of the second season of Agents of SHIELD, featuring said villain) with his fist. 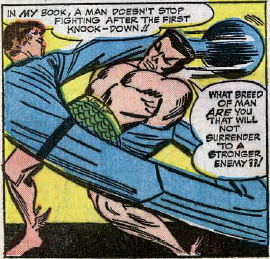 Note how his legs function as handcuffs, wrapping around Namor's wrists to continue the hold. It's a great piece of choreography, and the kind of move we need to see in the upcoming movie.